One of the joys of travel is discovering little recognized power spots. The well trodden path can be awesome, but so can the remote and unsung corner. 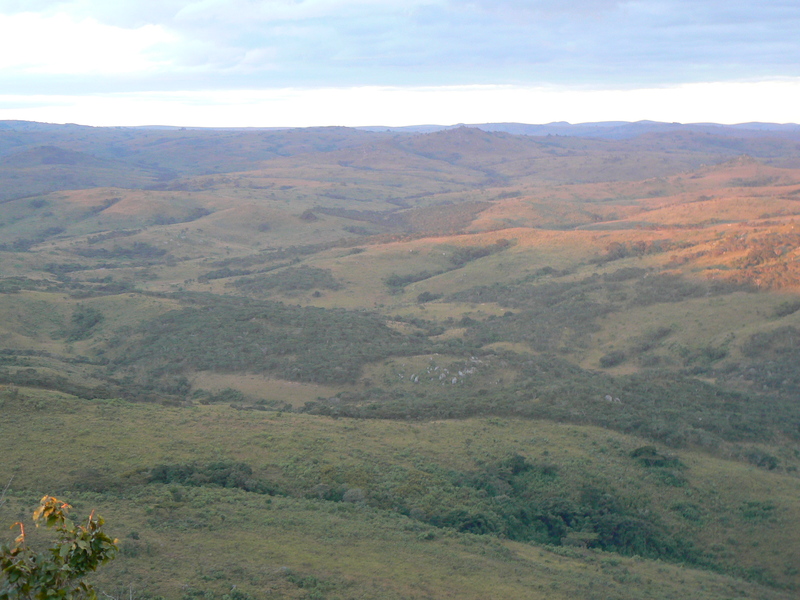 One such place is the Nyika National Park, a huge tract of land in Malawi of around 3000 squ. km., situated at the southern end of Africa’s Great Rift Valley. Its borders are with Tanzania (in the North), Zambia (in the West) and Mozambique (in the East). 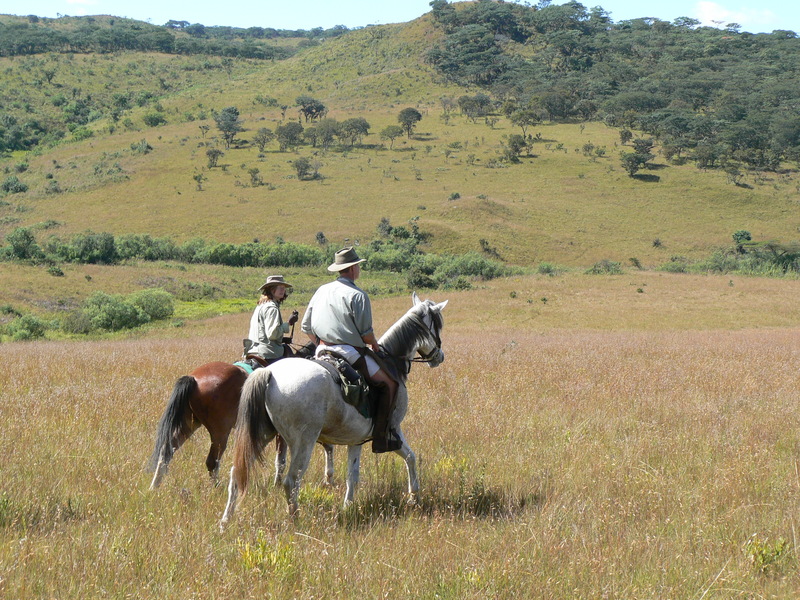 I traveled to the Nyika with friends to explore it on horseback. Having flown into Malawi’s Lelongwe airport, we changed to small charter planes, flying on for nearly 2hrs over the country’s heavily populated central area, to the relatively empty highlands of the North and the Nyika game reserve. The Nyika is an area that has never been effectively highlighted on the tourist radar, and as a result it has really only been visited by handfuls of hardy travelers a year, since the 1920s. Many of those come specifically to see rare migrating birds, like the Blue Swallow and the Wattled Crane. Today it feels untouched and pristine although it is under pressure from the surrounding communities who struggle to feed themselves as their population booms. Some of them once lived within the Park’s boundaries but were forced to relocate as the vision of the National Parks to preserve this scenic area came into being. There are few big game animals to be seen in the Nyika due to high levels of poaching and insufficient staff to tackle the problem. Elephant run scarred, and indeed there are only small herds scattered over the entire area. But the park is rich with beautiful herds of antelope, an obvious temptation as a food source for the local population. In a single day’s riding we cleared four poacher’s snares at a remote, river-crossing. They had been camouflaged with such skill that one of our front riders nearly stepped through the wire and into the trap. Led by David Foot, a skilled trained guide, eight of us set off, firstly on daily explorations from the comfortable lodge at Chelinda which overlooks a vast expanse of rolling plains stretching as far as the eye can see, interrupted only by the occasional large, low, rock formation. Later we rode out for days, camping each night in remote valleys on our way to an area of this vast park that even David had not had the opportunity to visit for two years. We carried all our possessions including our rubbish in and out of our campsites with us, so that the land remained as unsullied as we found it. Our intention was to leave as little evidence as we could of our presence, so we washed in the rivers and cleaned all our dishes using only the pebbles and sand from the riverbeds that we camped beside. The route itself was often impassible, over-grown with vines and tall grasses which our crew had to clear in order for us to continue. They kept a sharp eye out for small seemingly innocuous streams which can cause fatal injuries to horses carrying weighty human loads. Our days were always exciting, and each one brought new adrenalin activating challenges. One evening, arriving late in the area we were to camp after a grueling descent on foot down a steep escarpment, we surprised a small herd of elephant. We were up-wind of them, and it was our horses who first alerted us to their presence before the sound and movement that they made, as they foraged just feet away, reached us. What we didn’t immediately realize was that we were in a place close to the apex of two converging rivers, and that the elephant could not pass us without retreating past us along one line of this triangulated area. It was a dangerous situation, one in which they might rightly have felt cornered. We watched spell-bound, knowing that a fast exit would have been extremely difficult for us, as we could only go in one direction … backwards! … and it would not be easy or speedy as we’d ridden in through a tall, thick reed bed close to the river. Horses are very fearful of elephant, and ours looked at them with ears pricked, quivering from head to tail in alarm. Our challenge was to keep them calm and static, and to be ready to react FAST if the elephant exhibited serious signs of charging. It just worked….But only just! A single young male elephant picked up our scent. He raised his trunk to smell us, and spun in a dummy movement of threat, snorting, tossing his head and flapping his ears in a show of alarm. As elephant have poor vision but an acute sense of hearing and smell, David flapped his arms in a grand gesture of movement and slapped his hands loudly on his thigh, to alert the herd. Now realizing where we were, they moved off at the run, trumpeting as they went. Fifteen elephant stormed by within feet of us, ears flat back and tails raised in classic signs of their alarm. Meanwhile, I sat on a pirouetting terrified mare who wanted to run anywhere out of the vicinity herself. It was a thrilling, exhilarating experience. We all knew how privileged and lucky we were to see elephant in this area, and how rare it is have such a close encounter with them anywhere in Africa. Two years later I went back to The Nyika with the same group of friends, leaping at the chance to reconnect with this incredibly special place – a place that is so pure that one can be transported into another reality with consummate ease. David and his wife, Robyn, had announced that they were leaving the Nyika later that year, taking their horses with them on a long trek down from Malawi to Botswana. Chelinda lodge was to be closed. The Parks had decided that they could no longer afford to run it. This time we rode to other parts of the plateau, along different river valleys and into varied and equally beautiful lands. We found areas of standing stones on high grounds that seemed to be charged with ceremonial gravity. We had new high adventures tracking elephant after a night of intense commotion close to our campsite in which our alarmed horses broke free from their temporary coral, sensing the presence of a herd nearby. The next morning we followed the elephant’s tracks, this time stalking them and eventually losing them in dense old forest growth in a steep valley. On our last day we found a place of such profound potency that I was almost moved to tears by the connection I experienced at a huge and powerful natural portal, where creation frequencies stream unrestricted into the Earth. 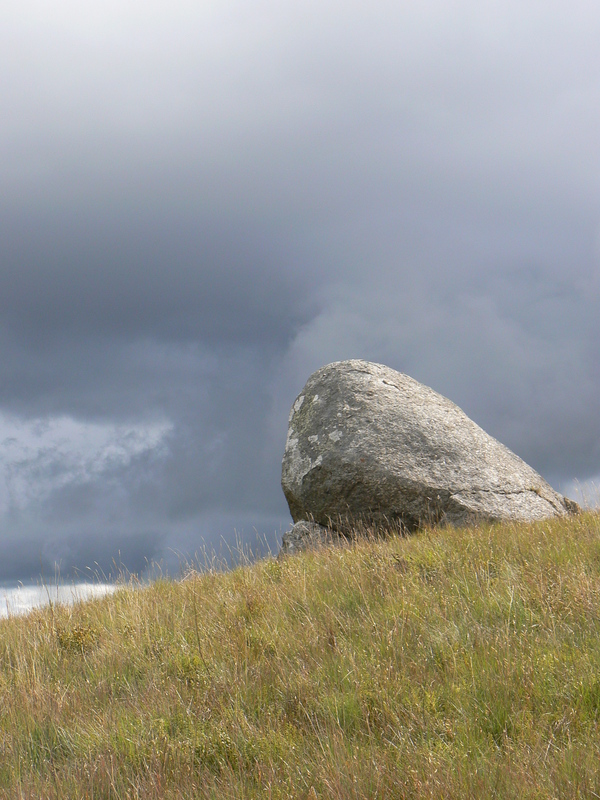 I felt completely humbled by this enormous, relatively flat stone area, which I’ve come to think of as ‘The Anchor’. It looked like the bow and body of an enormous ship riding the undulating waves of a great sea of billowing grasses and ferns. You could say these were fanciful, intuitive thoughts, but I trust my senses, and I recognized in this place in Africa why the Great Rift Valley has the reputation of being the seat, the cradle of life on this planet. To those who are able to, traveling by horse can be a wonderful way to journey in a foreign land. Of course, you have to like your horse and s/he you, but the potential for adventure and discovery is terrific. By traveling without engines, taking all the supplies you will need with you carried by pack mules, or traveling with the bare essentials in your saddle bags as we did, the feeling of the ancient and the sacred rise up in whispers from the silence, and harmony with the land comes naturally. Where my first impression of the interconnectedness of the Nyika Game Reserve had been one that expanded my senses and awoke me to the universal nature of this great tract of land, the second time I visited it was a sense of connecting to the heart of the world, in the heart of Africa – a land close to my heart – that was so overwhelming. I felt the rhythm moving through the land, like a steady beat of creation, and felt how deeply this part of Africa was assisting in maintaining our equilibrium and evolution. It is not just a place of isolated local power, in my opinion. It is a place of great significance for all species, a place of connection and grounding from the center of the earth to the higher dimensions of existence held by creation. 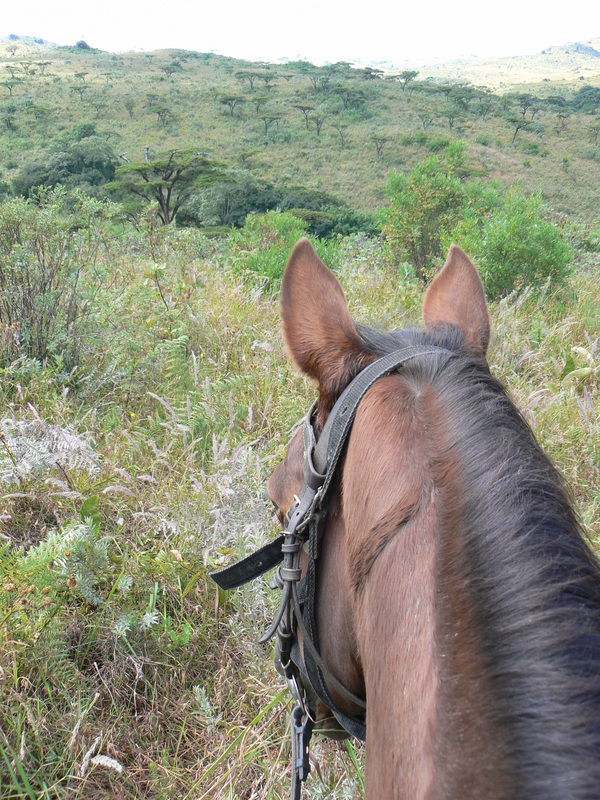 I find great companionship traveling and exploring on the back of a horse. Sometimes riding is about adventure, dashing off, feeling the exhilaration of the wind and the ground tearing by underfoot. At other times the pleasure is in settling into a place of deep contemplation at a rhythm and pace that allows really profound connections with the land. A feeling of total synergy and oneness that brings out indescribable feelings of the joy of simply living! Before going out riding, I send out my prayers. I spend a minute or so silently communing with my horse, saying hello and connecting personally. I ask that my horse helps me to ground in a way that is just right for us both, so that we are in alignment with each other and the land we are to ride across. Then once this connection is present and before I mount, I call in universal laws. In every aspect of my life I invoke and engage the Universal Laws that inform and regulate life. Apart from Spiritual Law itself – which is a major law that allows us to maintain the fluidity and sanctity of our energy field as well as a harmonious relationship between spirit and matter – the most important of these laws for me when riding, is the Law of the Land, so that both my horse and I can be in tune with the land that we pass through, and can interconnect in a way that serves, protects, and nurtures us both. 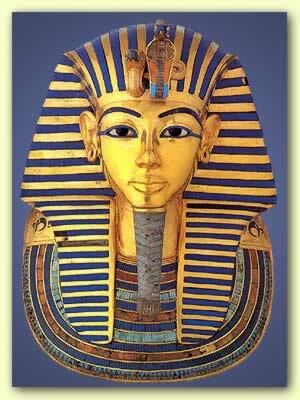 I also generally ask that any and all leylines and other lines of magnetic frequency that are not healthy for either of us are sealed from us. I do this by calling on the regional Devas who watch over the area I am in and I ask for their blessing and protection. Even in the most sacred of places there can be portals and lines of potency connecting to lower distorted vibrational existence, running cheek by jowl with places of the purest highest nature. 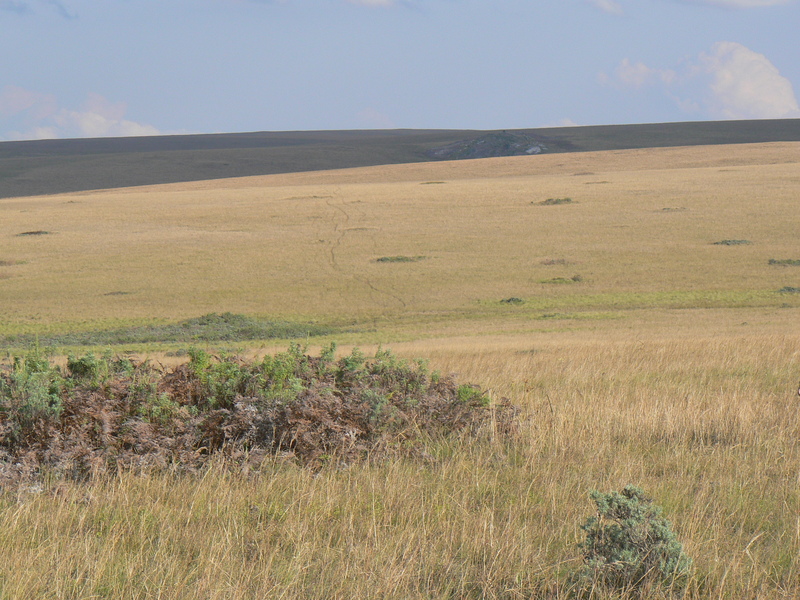 In the Nyika we came across just such a spot in a small valley where there were a group of Hyena dens. I have absolutely nothing against hyena, in fact studying their behavior and family relationships is fascinating, but the pall hanging over the land at this place was like a dense cloud. Death hung in the air, and vultures hopped around on the ground reinforcing the distorted frequencies that coated the small valley that housed their den. Once you have called in the laws that inform your day – Love, Creation, Grace and/or many more – and the spiritual beings who you are asking to assist you that day – perhaps Devas, Angels, dimensional or inner planes guides, guardians of the land and the plant and animal kingdoms, your own guides and teachers – then you can bring your full attention to your experience knowing that you are being supported and blessed! At various times during the day when the terrain or the temperature dictates, you may travel over some distance at a walk. It will be obvious to you that you aren’t suddenly going to be surprised as your companions careen off. They are probably all in ‘the zone’ too. Take advantage of these moments to meditate and contemplate! The meditation that I share here is a wonderful for experiencing yourself at one with your surroundings while remaining fully aware, with your eyes OPEN!! Drop into a place of silence. Allow your horse to fall into its natural cadence. Be sure that you aren’t ‘working’ in any way, and let go of all impulse to be controlling. Allow your body to move easily, letting go of any stiffness or holding. Become aware of the rhythm as you walk and tune into it. Take in the beauty of your surroundings. If you get distracted by your thoughts, just notice what is around you and come back to the moment. Connect with the feeling of gratitude. If you are not already feeling it, take in the awesome qualities of your surroundings and allow gratitude for your good fortune to emerge. As you feel gratitude notice how your heart opens. Notice how your internal rhythms synchronize with the rhythm of your horse, and the rhythm of the land itself. Become aware of the Elements as they affect the land you are riding on, and activate your senses more deeply. 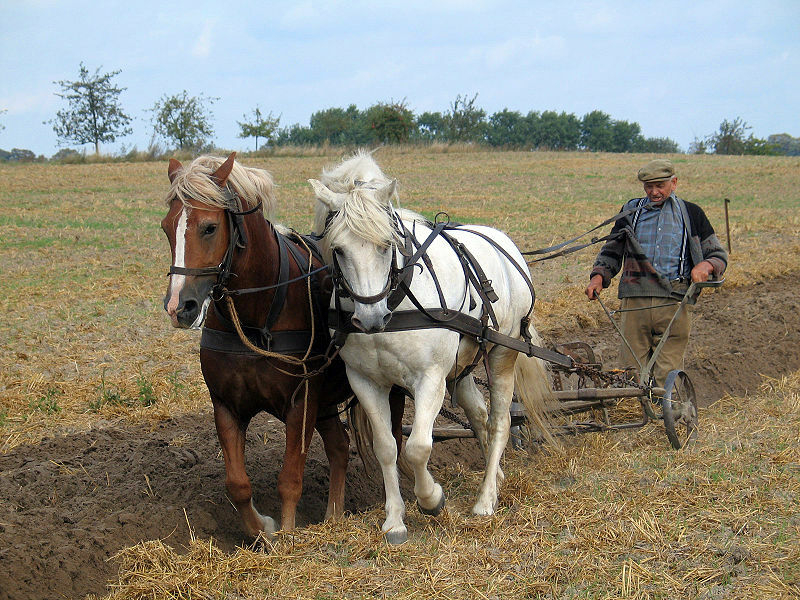 Listen to the sound of your horse’s hooves as they connect with the ground, and brush through any grasses or sink into the earth, and let this deepen your internal sense of the rhythm of the land. If there is a wind, notice how the grasses are moving around you and appreciate their rhythm too. If there is sunlight or clouds racing across the skies, notice how their light plays on the landscape around you. If there are birds calling listen to the sounds of their song. Look at the entire landscape and how it naturally forms a container for all of this, and for you. Feel the Joy of living. Let your heart energies flow out into the world nourishing yourself and your surroundings. Notice how connectedness brings forward natural feelings of harmony within you and towards everything around you. Notice how an inner silence emerges. Let the silence radiate out from your heart center to include your entire body, your horse, and all the land around you. You and your horse are united by rhythm and movement, joy, contentment, and by your gratitude. Even as you move away from the conscious aspect of this meditation, allow this state to continue with you as your day progresses. For some more information on Spiritual Law, read my posting Traveling Meditation: The Indian Ocean, May 2011. For information about riding, walking and birdwatching safaris in East Africa with David Foot, email davidandrobynfoot@gmail.com. I’ve always loved horseback riding and so often over the years, when I have wanted to visit beautiful, powerful, places around the world, I’ve looked to see if I could do it on a horse. Apart from my love of horses, you can go further, deeper, more remotely by horseback than you can by vehicle or on foot, and I love the unique connection that a horse gives me with the land and that special feeling of togetherness and warmth that our partnership elicits in me. Towards the back end of the 1990s I connected with Nigel Harvey, the founder of Ride World Wide, a great company designed for riders who love adventure. I wanted to ride in South America. I didn’t want to be in a large group, and I wanted horses that were sensitive and well cared for, and an outfit that was expert in both camping and riding. I had a shopping list of things that were important for me! Nigel, a knowledgeable horseman and experienced guide, knows all the right people who can provide that, and he leads some of the trips himself. 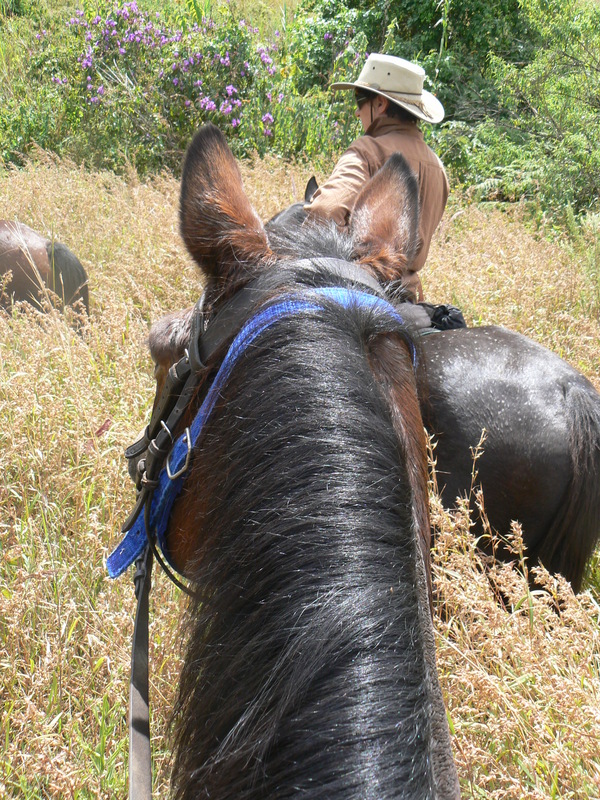 Going to Tupungato was one of the most profound trips that I have yet taken on horseback. 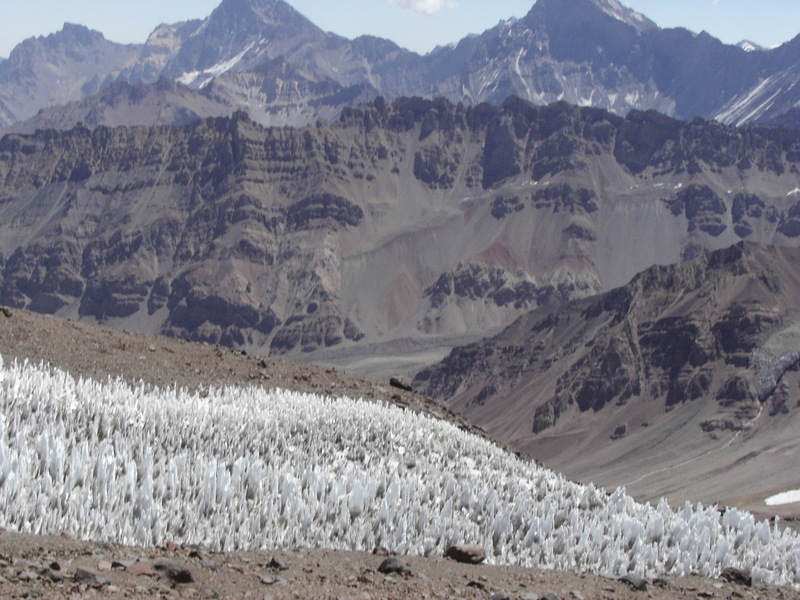 At around 21,500ft., this volcano is one of the highest peaks in South America, and the highest active volcano in the central Andes, if not the world. It is surprisingly close to Santiago, but perhaps because of the rigorous nature of any hike near its base, and because of its use as a military training area, the entire region is not often visited, even by Chileans. The only seasonal regulars are herdsmen who take their cattle up to the high pastures for good grass late in the season, and high altitude endurance mountaineers training for their big peak trips. It was a rare privilege to be part of a small group given a license to ride and camp there. 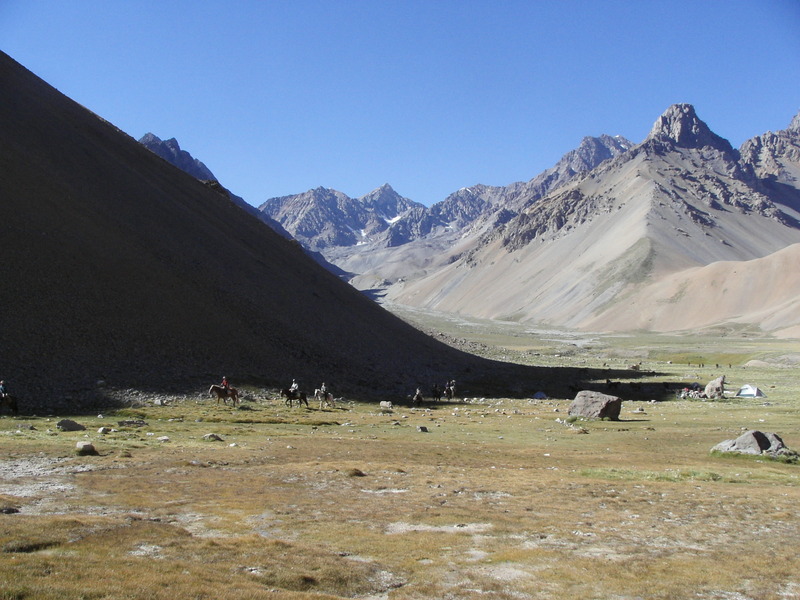 The Cajon del Maipo valley, at about 10-15,000ft, is a vast area around the foot of Mt. 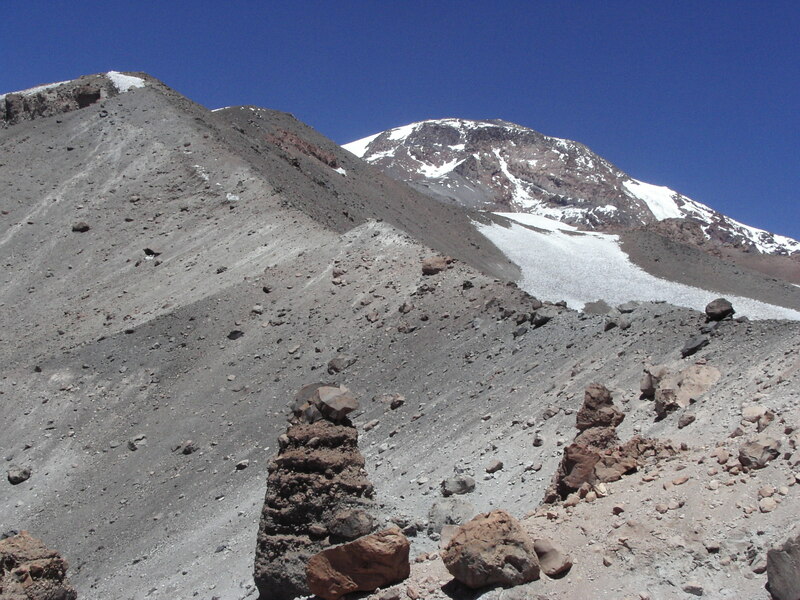 Tupungato, and her dormant but smoking sidekick, Tupungatito, and it is inaccessible for all but three months of the year. These volcanos which sit shoulder to shoulder, guard a section of the border between Chile and Argentina, in an area so remote that it used to be a safe, regular route for cattle rustlers and bandits ‘laundering’ their bounty. The area is stunningly beautiful, with ranges of mountains rising out of high altitude vegetation of tufty grasses and low lying plants, on a ground which, in places, is rich in black ash-like soil or shale. The partly visible old lava flows scarring the bases of some of the peaks also remind one of the heavy volcanic activity, some of it within the last 30yrs. The mountains drop into steep valleys terminating in fast flowing rivers which can make travel a heart-stopping adventure. Several times on my trip an unstable footing in deeper waters seemed as if it would turn a crossing into a drowning. The thing to do was to hold on, let the horse find its way and remind it of the right direction if it started to protest or waver. 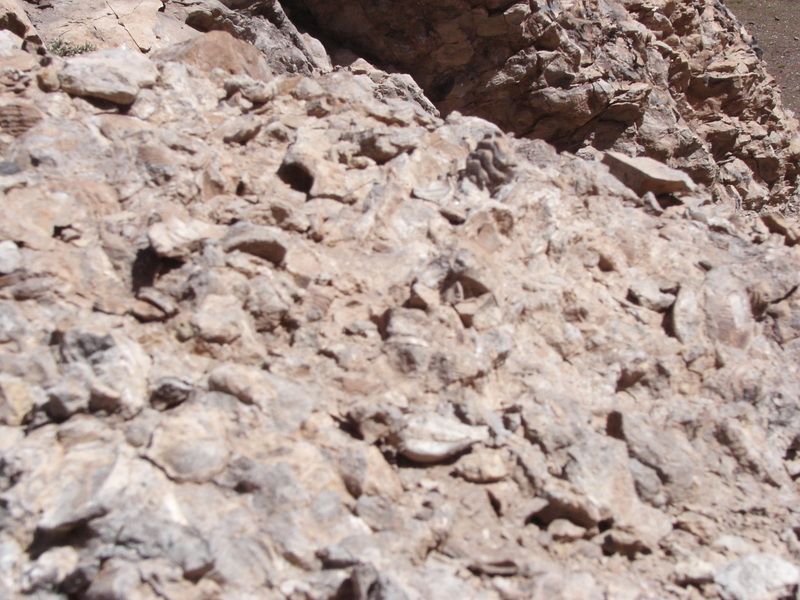 The same could be said of descending some of the impossibly steep shale slopes into the valleys. But on the high planes there were moments of pure exhilaration where we could drop our reins and gallop away like cowboys riding for our lives. It took our small group a short morning to get to the entrance of the reserve. We were just six riders in two jeeps going in. Once there we met up with the four gauchos, who tended to the horses and the camp, and who had ridden our horses in the day before. As we passed through the guarded entrance and drove between the high walls of a gorge on our way to rendez vous with the horses, we were buzzed by two condors that seemed to look directly into our cars. It was an eerie start. About half an hour later we stopped at a rustic hut where we were matched up with the horses according to skill, size, and temperament, and, with only a quick try-out, we were on our way. I think of epic tales when remembering a journey such as this one, especially as we had such a clear and distinct passage from one reality to another. We left behind low-lying verdant valleys rich in vineyards, moving upwards on roads cut in the granite to cross over into a land of ancient grandeur, where mountain peaks only revealed themselves, mysteriously, once we’d ridden along way down a hand-cut trail. The only way in was to follow this path. It was also the only way out! We were told to keep well in because animals were known to slip on sections of this rocky track and fall to their deaths in the fierce, fast flowing river below us. It was easy to believe. Our pack animals were in a particularly precarious position with all our supplies for nearly two weeks balanced in panniers across their backs. My heart jolted just watching them, especially as occasionally one of them would clip the edge and stumble, rebalancing quickly as it moved on. Once through that test, we picked our way over boulders littering a narrow path cut into the rock of this steep valley that eventually led us into a reserve that is so isolated only helicopters can get there in a day, and jeeps can’t get there at all! Indiana Jones would have been right at home, and even though I didn’t know it at that point, like him, lost treasure was awaiting me – the treasure of reclaiming a long forgotten aspect of myself. That first night we didn’t arrive at our campsite until dusk, and we had no time to explore, only to hurriedly put up our tents and gather for supper, exchanging excited chatter that tapered off as exhaustion struck and sleep beckoned. It had been a long day full of new experiences. 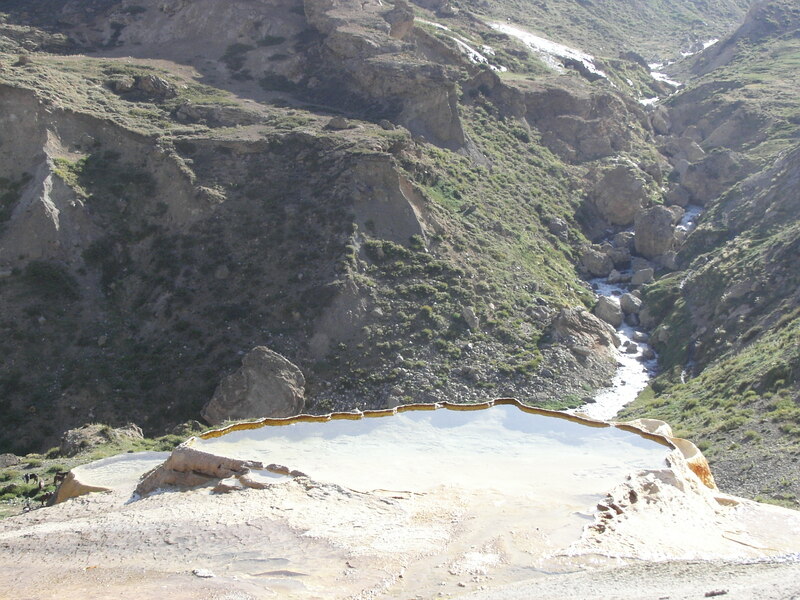 On waking, we found ourselves in a beautiful spot, close to a cascading sulphur-enriched spring, whose pools glistened a golden yellow in the early morning sun. It was still chilly as we explored our immediate surroundings and chatted over simple breakfast before packing our tents and helping to ready our horses for another long day. I could imagine being a cattle rustler that day as we weaved along an indistinct track leading vaguely into the heart of the Tupungato reserve. The landscape was big, in John Wayne fashion, and stunning. It was uplifting just being there, the kind of experience that called forward awe and silence as we settled down, finding our own rhythms and enjoying our horses, the majesty of our surroundings, the hot sun, and the high rare air. Mid-morning we came across the skeleton of a dead cow. Simultaneously, Nigel and I saw some condor feathers around her and I called to Nigel that I wanted to stop and get off to pick up one that had caught my eye. Instead, gallantly, he hopped down and handed it to me – a huge flight feather with a quill as thick as my little finger. In that moment, and in our excitement, both of us lost attention for a second – a dangerous thing to do around horses – and as Nigel stooped to pick up a second feather his horse shied away, struggled out of his hold and, turning, lashed out, kicking him in the thigh. It was a very dangerous blow that broke a blood vessel causing a pool of blood to collect in his upper thigh. Though none of the rest of us realized how serious this was until days later, the potential threat of this injury was huge, and in almost any other place it would have sent him immediately to a doctor… but we were nowhere near help, and he wasn’t about to abort the trip. For the rest of that morning and into the afternoon I rode clasping my condor feather in my left hand. I felt like nothing could spoil my day – I was at home on this land, and bonded with my horse and to this bird’s feather in a way that I didn’t yet fully understand. I would have done well to have absorbed the lesson Nigel had learnt in a heartbeat that morning, but I hadn’t, and at the end of that afternoon, as we broke into a canter approaching our next campsite, I was inattentive and unprepared. My horse slipped and as I tried to regain my balance, he lost his and we fell together, my left leg under his flank. It was the last thing I remembered! When I came too I was being carried into the camp on an old door found nearby that, once upon a time, had graced a shepherd’s hut. I was concussed, drifting in and out of consciousness, feeling as if I was in a dream. Though a lot better the next morning, Nigel ruled that I was to stay put and rest that day as we were to spend two nights in this camp. I did exactly as I was ordered, sleeping almost the entire time, surfacing either to look at the Andean geese that had landed on the nearby banks of a burbling stream, or just to breathe in the sheer and incredible beauty of the peaks all around us. Some days later we completed the trip up to Mt. Tupungato, on one of the most arduous rides I think I have ever done. 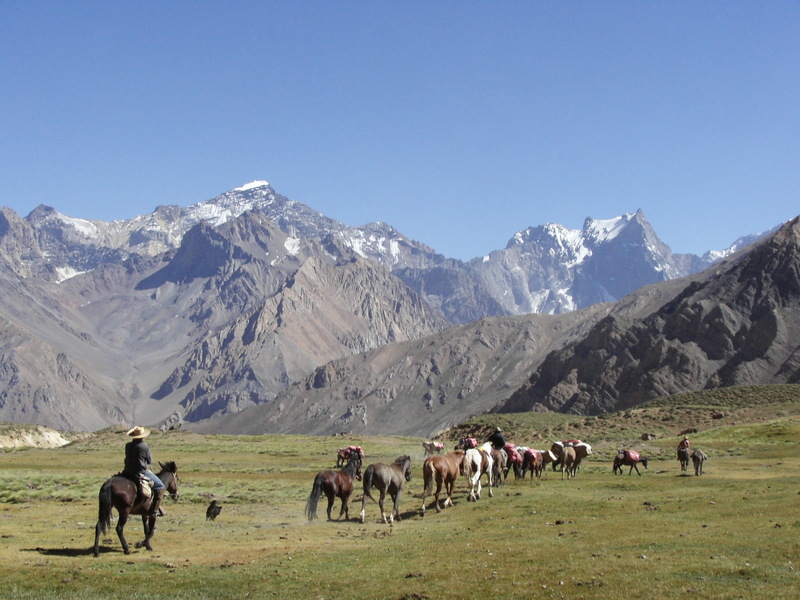 This ascent is very hard on a lot of horses, straining their hearts impossibly with the effort and the altitude. Mules were switched in where some of our horses were deemed unsuitable for this terrain. I ended up on one of our pack mules. He went at exactly his pace and ignored all directions from me unless it suited him … and I can’t say I blamed him! We started at dawn, and ended at dusk. It was an exhausting day even for us riders. The path moved relentlessly up, first through broad valleys overlooked by giant snow-capped ridges, then up a steep zig-zagging path of shale onto Tupungato’s shoulder, and finally through a stalagmite field of ice that lead to our destination, a narrow ridge a thousand foot or so below the peak. Once there it felt as if we were looking out across the whole world. Vast swathes of Argentina stretched out in front of us and behind us the bare, colorful mountains and valleys of the Tupungato reserve. It was magical and memorable, and the air so pure that its taste is still with me today. All of our remaining days in the area were, thankfully, uneventful in the dramatic sense, but all were days that even years later remain etched within me for their unique qualities, for the exquisite quality of the landscape, and for the resilience that this terrain demands. On arriving back in New York I had intended to give my condor feather to a dear friend of mine, but when he came to collect it I found myself weeping. Even though I handed it on and saw him walk out of the door with it, I was unable to let it go, calling him the next day to ask for its return while I explored my issues. The exploration that followed revealed to me old roots in South America, and a connection with the ancient Condor People of the High Andes. The integration of it returned to me long forgotten knowledge, and started me on, what felt like, a new life’s path. Treasure indeed. Firstly, I contacted a shaman to work with me and the Feather, to help me to understand what I was experiencing. She was very clear with me about the information being given through her. If I wanted to disconnect from the Feather, I was to do a specific ceremony over a number of weeks to separate its consciousness from mine. In addition, as we journeyed in our session it was revealed by the spirits connected to us that this feather was a reminder to me of a task that I had been sent on as a messenger for my Andean tribe many lifetimes ago, to take out a gift from the heart of the people to humanity beyond their borders – a gift with knowledge for the world outside their reality, imparting their wisdom for the greater good of mankind. Unbeknownst to me, part of that assignment was that I would lose the gift in order for it to be found by these people, and then owned by them as if it was their own discovery. I did lose it, but in the wave of emotions that accompanied my perceived failure of a trusted mission, I also lost contact with my own heart, and with my connection to the gift. The Feather had come now to remind me that I did what I was asked to do, and to help me to forgive myself for the personal consequences of my misunderstanding, and by so doing reconnect once again to an ancient aspect I hold, and to my heart. The knowing served to strengthen my bond to the Feather, and with great grace my dear friend willingly released it back to me permanently. My next step was to get help for myself. I’d felt fine for the rest of my trip in the Andes, but once back at sea level I struggled physically and emotionally. The effects of the concussion were definitely still around, but on top of normal symptoms, I felt as if I was drowning, held down by a chain, and I had started to watch myself carefully on the streets as I was weaving about, even being inexplicably drawn to crossing the road at the wrong moment on a couple of occasions! It really wasn’t funny! When, a few weeks later, the improvement I hoped for with time had still not arrived, I called my mentor, Dr. Patricia Fields, for help. In the course of the next few weeks Pat helped me to understand what was going on. My structures had been dissolving as I had completed and crossed over a major vibration of my soul, using the pure Andean energies, and the concussion as the platform from which to do it. I could feel the truth of some of what she said immediately, but it would be weeks before I felt stable and strong and could walk in a straight line again. Not only did I experience physical changes, but people and pastimes that had interested me prior to my trip now had no hold on me at all. The full integration of my journey, the nature of the energies I had been gifted, and my physical transformation following it took several months. In this period I had no option but to surrender to its flow, and trust that I would align with and integrate this new vibration of my being with time and patience. As it turned out this was one of a number of karmic completions, soul integrations of existences I had experienced as part of different indigenous tribes and peoples. This valuable awareness helped to shine a light for me on my psychological challenges today and to learn self-forgiveness. I also deepened my appreciation for the unique and valuable nature of all our diverse cultures and the respect that each one’s unique qualities deserve. For information about great riding adventures contact Nigel Harvey at www.rideworldwide.com. 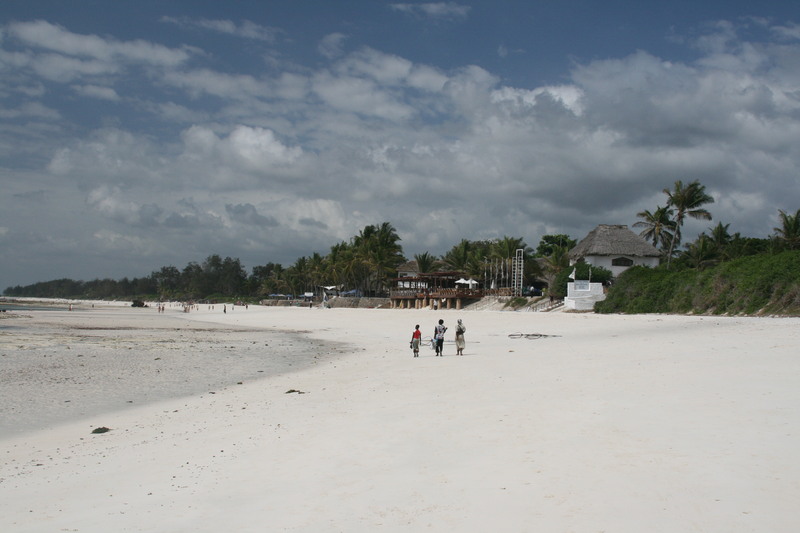 Going to the coast was always a special part of my time in Kenya as I grew up. My memories of those holidays are full of happiness. The Indian Ocean has a very gentle quality close to the shore, and the presence of a coral reef means that swimming is relaxing. What a treat to wake up early on those hot days, and step out across the exposed coral or onto the white sands to walk for a while, or swim, as the fishermen and beach boys quietly prepared for their day. It was a time of contemplation for me, full of peace and gratitude, breathing in the beauty and the blessing of being alive. On low tides, as I walked, I’d stop and pick up shells, and watch the sandpipers – tiny fast moving birds – racing to find their treats in the damp footprint of the last wave. When I reached open coral pools, I’d look down to see what fishy creatures have stayed as the tides rolled back, becoming easily absorbed in entire worlds of seaweed, shells, crabs, anemones, and the tiny colorful fish beneath my gaze. I’d be back out there as the tide turned from its high point, and the seas gentled, to experience the rhythm of the waters and in doing that come to a place of peace and renewal for myself. Understanding that my natural way and rhythm may not be the indigenous way of some of the places I visit, I like to bring myself into alignment with the energies present. It’s similar to being a good houseguest, adapting to your hostess’ rhythms so that your visit is entirely pleasurable for you both. In this way, wherever I am, I approach that place with the intention that balance, harmony and connection flow easily. I have a primary life practice that I take with me wherever I go. I invoke spiritual law. It’s a practice of invoking universal dynamics, the laws that regulate us all and organizes every aspect of life. To me this feels like greasing my wheels so that they interconnect with the energies that I am in relationship with, in the environment I am in. My understanding of the nature of spiritual law comes from a body of teaching I have received from Dr. Patricia Fields over many years. As she teaches it, Law is part of the organizing principle of life which governs the right use of energies and forces, and allows evolution (or devolution) to happen in balance so that all elements, physical and metaphysical, can harmonize with each other. It is a constantly moving, harmonious regulator that interconnects with everything, informing and lubricating the spiritual highways of life, the sacred geometry that we first use when we incarnate and step down into existence. Invoking spiritual law is part of my daily practice, as well as being part of my meditative and healing practice. There are a few seminal laws that I call on regularly, including Spiritual Law itself. After that I call in the laws that feel important for that day, or that feel right for the moment, the practice, and the location. But first I start by centering in the heart, and only once that connection is made do I begin. Examples of laws that might resonate with you too include the Laws of Creation, Grace, Love, Divine Will, One, Forgiveness, and Freedom. The first time I called in the Law of the Oceans, I felt as if I was going deep sea diving. The change of pressure and the sense of moving into another world was really unique. One of its effects was to regulate my etheric structures with the oceanic ones so that the differences between us were bridged. I came away with a much fuller understanding of the unique qualities of the element of water, and was thus able to embody a deeper respectful relationship with the sea and all her inhabitants. A favorite coastal meditation for me involves surrendering to the flow of the water. It originates from a sound healing teaching, given by Tom Kenyon, on Quan Yin and how she reached enlightenment, and it involves using your audial awareness as well as your every day sense of awareness. To activate audial awareness you first listen to the sounds around you deeply enough so that their repetitive pattern lulls the brain into a receptive state, and then you step back from that so that you become aware of being aware of the sound. Finding a place with not too strong a tidal drift, walk into the water up to your neck, so that your toes can just make contact with the Ocean floor. This gives an anchored base, a grounding, but also allows your body to move with the tide. Bring your awareness to your heart center in the center of your chest, and when you feel ready invoke Spiritual Law, and include the Law of the Oceans and any other Laws that you feel called to connect with. Take a few minutes to allow your body to relax, and to let your thinking mind become familiar, and feel comfortable with the rhythm of the sea. You may need to have your arms out to minimize your drift in the gentle current, or to find the equilibrium between you and the water and your central point of balance. Your eyes are open, resting in a very gentle unfocused gaze. Take a few really deep breaths to enliven your energy centers, moving your awareness with your breath from your crown, through your heart and diaphragm, down into your pelvis, to your perineum and into the ocean floor beneath your feet. Breathe in the incredible smell of the sea, and the energy of the sun’s light as it enlivens the water around you. Look at the patterns it creates as it dances in the water. Enjoy the sensation of the water licking your body. Send out your gratitude for this moment and for the beauty of creation all around you. Notice how your cells start to embody and respond to the rhythms of nature being taken in by your senses, and keep breathing in the ocean’s energies. You are experiencing a visceral lullaby to your being as your body is rocked by the current. You may feel the physical boundaries between you and within you are diminishing. Feel how deeply restful, soothing, and full of contact and joy this state of being is. Now bring your awareness to the sound of the water as it rolls in to meet the shore. Stay with that for a while. Notice your heart and how softly and widely it has opened allowing both this state of interconnectedness, and for each part to abide in each other. Rest here for as long as you like before you begin your journey back. Visit www.sarahlidsey.com/resources for links to Pat Fields and Tom Kenyon. I’ve been clarifying for myself how aspects of evolution operate, and in doing so identifying two distinct ways. The first is through duality – karma. 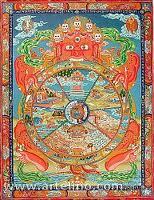 Its mechanics are mapped in the Buddhist teachings of the Wheel of Life and Death, amongst other places. The second is through non-duality, via pure Spirit and Grace. Both occur as awareness returns to full Divine connection, through the heart. Karma requires understanding and self-forgiveness in order to clear, but transformation through Grace occurs as spiritual evolution allows higher vibrations of Being to be embodied. We naturally connect with both paths, and though closely intertwined, it would appear that one does not require the other in order for change to occur. It seems to me that if the root of an issue is fear-based, then karma is the path taken, and if absent – and if the ability and desire to surrender from the heart is present – then Grace steps in. In the Wheel of Life and Death teachings around re-incarnation, we are born into our present circumstances according to how we have lived in the past, manifesting our reality to include old issues, generally of a personal, ancestral, or cultural nature. We choose to come back to resolve these, and at the point of our death move onward with accumulated ‘credit’ for those positive qualities that we’ve accrued, such as generosity or gratitude, and also with any unresolved or new baggage, so that it can be transformed in a future life. The different dramas we create in life will continually draw us back until they are all resolved and we are liberated from this cycle. As walking, talking, living, breathing, embodied spirits in human form we have the opportunities to experience everything –love, hate, cruelty, deprivation, abundance, abandonment, peace, bliss, joy, and more. I know that I have had the blessing of different life experiences over incarnations – I have been a victim, and I’ve committed incredible cruelties, as well as being a force for good – they come back to me in snatches when circumstances trigger my awareness, or a behavioral pattern is approaching transformation. Each life remembered has had a different flavor, different challenges, and has greatly expanded my compassion for self and others. As I have met them, the misunderstandings or distortions at the core have needed to be acknowledged and forgiven before understanding dawns and real changes can occur in present time. My appreciation of the distinct qualities of transforming through the different paths of Karma and Grace solidified during a trip I took with Sri’ama Qala to the Yucatan Peninsula last year. I experienced transformation firstly through Grace, and then in another wave, an entire karmic pattern was cleared. I saw how they both address the multidimensional, multi-existent nature of being. I’d been taught about karma, it was familiar, and I recognized it having experienced before the relief of clearing its imprints. But even though I’d also been touched by Grace many times, before going to Mexico I hadn’t recognized some of its qualities, nor was I aware that its dispensations, which are not rooted in life’s karmic cycle, are themselves a branch of the evolutionary path. Resolving issues that seem unresolvable through its infinite compassion and wise catalytic power. Responding to an intention to open to new ways of living. Comforting those in need, when called forward with heartfelt prayer. Its presence points to the ripeness and willingness of embodied consciousness to evolve. When that is present it assists in the opening of the heart to allow divine love to be more deeply embodied. It can and does step in into the space created by karmic clearing, but not always. It is a branch of the path of evolution and, like karma, has its own core components, the signature notes of which are Love and Grace. 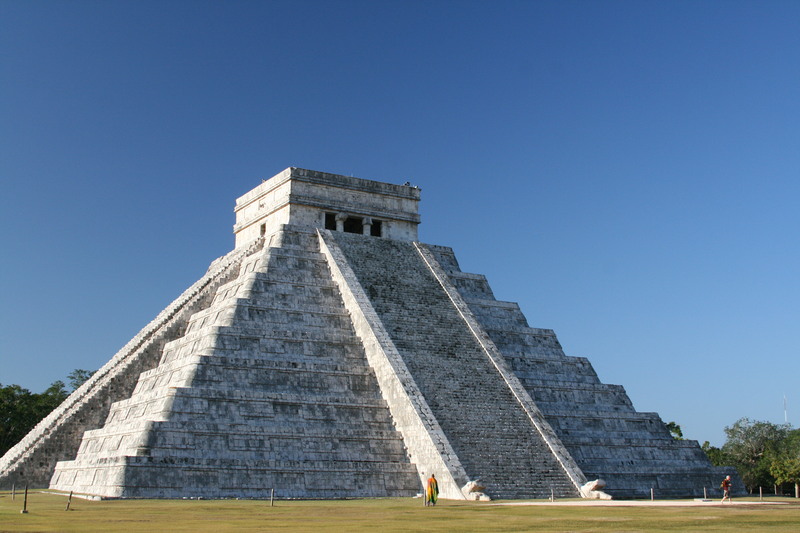 Though I briefly wrote in January about a journey I took at Chichen Itza, on a cool December morning last year in the building energies before the Winter Solstice (Pilgrimage of the Heart: Mexico and the Mayans) I am referring to it again because it is a quintessential example of transformation through the path of Grace. I gathered with other bright spirits as part of a group called forward for planetary service, through Qala, Enlightened Masters and Mayan Ancestors. In the potent energies around sunrise, they took us on a spiritual journey to open pathways for a powerful activation to occur. That morning I had no idea that the restrictions that I felt in my heart were anything other than karmic issues that were calling to be cleared. I assumed they were indications of more layers relating to issues around cruelty, worthlessness, and self-hatred that I had been meeting all year, rather than the birthing pains of an impending shift in consciousness. But as we traveled far out in the galactic energies that are accessible from this sacred site, I felt bands loosen from around my heart like the powerful uncoiling of tension cables ready to break free, and I saw for myself that the journey back through the heart has to affect every dimension, domain, or world of existence – in fact, wherever we hold our consciousness – as we return to our true nature as Source. As we energetically traveled out through the galactic suns I could feel the stretch on my energy field, indicative of the extreme potency that was being called forward from our group in order to assist in the task at hand. With each upward shift in gears I was burning off denser frequencies so that different aspects of my field could engage. I was meeting myself at ‘stations’ along the way from existences that did not have their origin on this planet. My vibration was increasing and I was being re-birthed by Grace in as much pure consciousness as I could handle, a state that continued until my chest started to feel like the air was being expelled out of me, and in that moment my heart exploded with a freedom and joy that rushed through me. I was moved to tears with the enormity of what had transpired, and filled with boundless gratitude towards Qala and the beings we were working with for presenting me with this opportunity to evolve. Having had this incredible experience of being touched by Grace only days before, I had no expectation of another profound shift on arrival at Palenque, even though as every day ended I’d say to myself ‘That was why I came – THAT experience today’. Everyday! 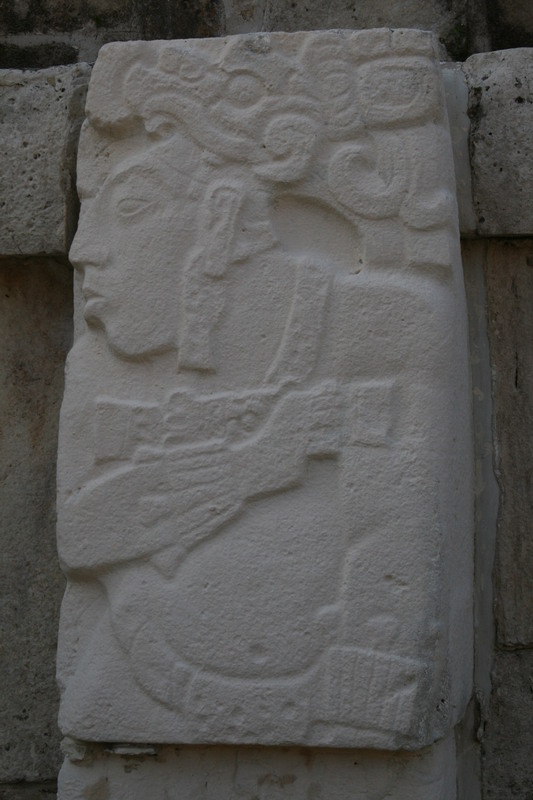 My time at Palenque was no different. As I journeyed through time and galactic space, I joined with the being that I was in Mayan times, acknowledging, embracing, and forgiving all the cruelty he had inflicted in his life, which had turned to separation, self-hatred, and shame in mine. In doing so my spirit soared and my field relaxed as unconditional love and understanding – compassion and wisdom – flooded us. The completion of this karmic strand involved a meeting of our hearts, in which I welcomed that ancient part of me back, reuniting with him and all the components involved in that separation of consciousness. As the movement went through my heart I felt my energy transform into the most brilliant golden light which then cascaded down through all my cells, I am sure forever changing my DNA. Once again, I was blown away by the personal significance of the event that had just occurred and by the feelings of relief and joy that coursed through my body as I let go of the denser frequencies that the karma of that lifetime had seeded in my being, and which I had held for hundreds of years. For information about Sri’Ama Qala and her work, visit her website, www.qalasriama.com. Times are changing for me, and for people all over the world. Its happening on personal, collective and planetary levels simultaneously. Kali is speaking to us in these times of seismic pressures and I, for one, am feeling it internally and externally. An aspect of the Divine Mother in the Hindu pantheon of deities, Kali’s powerful and mysterious creative forces redirect the universe in whatever way is called for, often unleashing destructive natural phenomena and uprooting our lives. Like Shiva she holds dissolution and transformation in her hands. Of all the Hindu expressions of the Divine Mother, it is she who provides us with spiritual opportunities to make constructive changes in our lives, and, if we listen, it is she who gives us the space to pause, look at what we are creating and then make changes to redirect that which is out of balance. Her wise directives can be hard to embrace, but if we don’t listen our lives spin visibly and invisibly with the turbulence she creates as she corrects our course. Personally, I’m out of sync with New York life and craving instead to live my life away from the City’s frenetic energy, hoping to find my place amongst the sounds and rhythms of nature. This month, after nearly 17 years, I finally uprooted and left. My pattern of realizing something has to give, continuing even with this knowledge, and only moving on and out when the whisper of impending trouble turns into a shout, seems similar to that being enacted the world over at the moment. In this moment, I see my situation as a microcosm of an invitation being given to humanity as a whole. This awareness is bubbling up from the subconscious into the rivers of life that sustain us, mobilizing the lawful balance of humanity with the planet that we live on, and with the spiritual impulses that move us, whether we acknowledge them or not. Kali is helping me, and I am truly appreciative. She’s worked with me before in clearing away accumulated debris on all the levels of my being at different times. I’ve felt her cleansing flames burn away issues that I had asked to be resolved. As they’ve been addressed, I experience the increased vitality that goes with releasing lower level or distorted vibrations. The natural ratio of spirit to matter means that shifts on the spiritual planes of existence need time to be absorbed, because matter vibrates at a slower rate than spirit, and every atomic particle of the biology needs to embrace and integrate change. Energy work has to be stepped down into everyday life in order for the changed state of being on the metaphysical levels to have impact on the physical, and so on life itself. Patience has always been a weak spot for me, and I haven’t generally allowed enough time for that, assuming my body can cope. After years of intensive spiritual practices it is protesting, and I am at last recognizing the gift of being here, now, in a body and the importance of restoring that body to balance by giving her space to breathe and assimilate. It is time for me to honor her, so that I can live in a way that is healthy, balanced and harmonious. Our bodies are microcosmic mirrors that reflect collective issues and dis-eases, and by even one of us addressing where we personally are out of balance, we help to restore balance to the whole. Health statistics in the United States alone suggest that the population as a whole is weighed down with toxicity from drugs and food. Distorted thought forms fed to us through propoganda and media also pervade our cultures and influence our actions. Each one of these affects how we act to self and other, and our expectation of and interaction with life. I am pretty sure I am not alone in my feelings that it is imperative that I find holistic balance now and if, like me, many of you are also setting out to regain your own equilibrium, then Kali’s transformative powers may provide the impetus for each one of us, allowing the collective and Gaia to transform as we do. Collectively, the most obvious change this month has been in Egypt where ordinary citizens, who weren’t prepared to be ridden over any more, protested peacefully to oust their longstanding dictator and his regime, and achieved it. The same impulse and the ensuing struggle is evident in Libya and, in Japan (in the aftermath of the earthquake and Tsunami) where the slow action of authorities and its potential to deepen catastrophic events, caused people to take the initiative into their own hands and organize preventative measures at the crippled Fukushima Daiichi nuclear plant. In diverse cultures around the world a new finer tuned sense of what is ok and what is not is slowly emerging, and people are finding their voices and challenging the authority of their Governments in order to institute change. In her omnipotent way Kali is incentivizing us by reflecting the consequences of our complacency and collective arrogance towards each other and our environment. The disaster in Japan is one major example of this, underlining clearly that we are fueling our existence in ways that are lethal to us all, not only to the local population. There too the heart of humanity has been all too apparent as people in need come together to help each other. Kali is encouraging us to embrace change. The Planet is shifting. It is almost impossible to view earthquakes and Tsunamis, tempests of magnificent proportions, as positive forces of change when thousands have been swept away or died or seemingly been condemned to death, and still more are in great distress. I posted a piece around this subject last year in The Death Force and Life (Oct. ’10). Since then our Earth has gone through an axial realignment as a result of this latest massive quake, and time is speeding up as the axial spin has been increased by the seismic events in the northern and southern hemispheres, centered in Chile in 2010 and in Japan this month. Changing personal let alone planetary axial alignments, even infinitesimally, can cause deep adjustments to how life is expressed through us . As she realigns around the world it is important to trust that there is a bigger picture and to put personal agendas and fears aside, even as our hearts open with great compassion. Universal forces of creation – Kali, if you will – are bringing new levels of awareness to the way we are living on this planet, and to the respect we show her and each other. Surely it’s time to listen now, while we are ahead of the curve! We’ve moved into the final phase of the Mayan Calendar during this period of tumult, and a major astrological event has happened with Uranus now transiting Aries, further underlining these energies of change. If the wisdom of the stars and that left to us by the Ancient Ones is to be believed, the end of our current way of living really is neigh. I hope so. New consciousness streaming into our awareness means that we will all have the energetic awareness and the opportunity to live life in a new way. It needn’t be a dream, but it may require that we step forward in some way to embrace the potential that is streaming down to meet us. Times are Changing! There are many ways to find out who we are and what makes us tick. So many brilliant and engaging teachers talk, write and live lives that help to light the way, drawing on incredibly rich traditions that have existed for centuries. But, for each one of us embarking on a journey of self discovery, it is important to know that it doesn’t have to ‘look’ a certain way. Don’t be put off from taking the journey by the dogma or the discipline you perceive accompanies it. There are many paths, and many of those paths have been tried and tested and deserve our respect, and yet no single path is right for everyone. So, if you like the teaching, but not the way it is taught, trust that and find your own way in, traditional or otherwise, and it will unfold you naturally into a state of deep knowing. In the process of stepping onto my path I was led in many directions, first questioning my own Christian faith as I was taught it, and then enquiring into the nature of God through other religious practices, all of them rich and helpful to me, setting me off in directions not restricted by tradition or community. Learning about the energetic dynamics of my being, and experiencing the changes in my consciousness through the process of hands-on healing underpinned my enquiries. As I evolved with the help of energy therapists, I listened to a diverse cross-section of teachers. Some seemed to reinforce the dualistic nature of life on earth and I realized quickly that I don’t choose to learn from them. I found that I was most interested in those who offered paths of direct awakening, reflecting back the illusionary nature of life and the dramas that we all create. ‘Who am I?’ is the question it all comes down to in these circles. My time in reflection with these masters has always been valuable, but I recognized that the dogma felt in the church of my childhood was there too, and that I needed to step out and look in other places as well, and most importantly I needed to drop into deeper relationship with my own life, and the illusions and restrictions that I create. For me, making awakened awareness ‘real’ was what counted, otherwise, I could see myself twirling around forever in some intellectual gathering, missing the living of life, sacrificing it to the question ‘Who am I?’ – Knowing, mentally, the answer is ‘You aren’t!’, but forgetting, while sitting on my hard town hall chair, that the real reason for following this Path of Understanding is to live life fully in the here and now, ascending into the body, not out of it. I was drawn to sell my apartment in New York and take my inquiry on the road. Initially I believed that I had embarked on my quest as a result of my own curiosity and determination to unearth Truth. But that turns out not to be so!! I have been guided all along the way, led on a journey of remembering long forgotten paths, and ancient wisdoms I had no idea existed. I’ve traveled to the four corners of the world, and to each continent, and have seen the beauty of this planet’s many diverse cultures, and I’ve been introduced to guides who have opened my eyes to the richness of the lands we live on, and beyond. My journey has been blessed with teachers whose knowledge of science and alchemy and universal dynamics have expanded my horizons and encouraged me to trust my senses. I’ve traveled far and returned, learnt from my contact with each place visited, and gone out again on the intuition that where I was being led to next would provide the next key to my continuing evolution. It always has. Meditation has been a part of each journey. It brings me into relationship with the land I am on, and through this I find that I increasingly walk this road with awareness from a place of contentment, appreciative of the beauty of life, the perfection of the imperfect, and the current that runs through us all as creative life force. As I continue to embody the experience of life, looking past the illusion, realization has sunk in – that life is living me, and not the other way round. I’ve already posted a few of my meditative experiences, all of which have been part of my Pilgrimages of the Heart (for instance, Africa and the Laikipia Masai, May 2010) and, over the next year I am going to share some of the meditations, spiritual journeys, and reflections that have been particularly impactful for me. Some have connected me to specific ancient teachings, and others have helped me to understand viscerally that we are so much more than our physical bodies. All have served to build my understanding of the continuous and infinite nature of life. My traveling experiences have been really varied, but reflection and internal stillness have been present everywhere. I hope that by sharing some of them, you too will be encouraged to continually question the ‘box’ that you inhabit, and keep opening to the true nature of existence in a way that assists you on your path. In the process, I hope that these meditations will also be an encouragement to all to connect spirit, land, and human experience in a way that assists us all in living here, now, in a harmonious and balanced relationship that unfolds in a way that is mutually supportive. Over quite a number of years I have been absorbing information about the ancient civilizations of the Mayans and the Aztecs, through books, exhibitions, and films. In 2007 I remember traveling on an overnight train from southern Bolivia up to La Paz having been horseback riding near Tupiza in some of the back country through which Butch Cassidy roamed, back in the day. That night as our train stood idle for hours and hours far from any station, broken down and being slowly repaired in torchlight by the crew, Mel Gibson’s gory movie, Apocalypto – about the horrific ordeal of some peace-loving Central American people at the hands of warring Mayans – played loudly, over and over again. The images were inescapable, powerful and impactful, and my attraction and revulsion to these people and those times felt really strong. I wanted to go to Mexico, but not alone, and only with someone who really knew the ancient ways of the Mayans particularly their spiritual nature, and their gifts. Right timing is a vital component of pilgrimage. Within months of recognizing that I was ready to visit Mexico, I attended a workshop in London with Sri’ama Qala. I had no idea of her connections with the Maya or any expectation beyond sitting in heart-felt meditation with a group of like minded people, and so was really surprised when, on the last day, she led us through a meditation that involved the Tzolkin Wheel, one of the acknowledged tools of the Mayan people. Almost simultaneously she announced her intention to go to the Yucatan Peninsula, and I recognized that I had at last moved into the orbit of the guide I’d been waiting for. The Yucatan Peninsula isn’t spectacular to look at when you are on the ground, but it has great beauty all the same. By dropping into the vibrant energies in each place we visited we experienced the vitality, the ever-present aliveness there. It was through the life force of each place we visited that we introduced ourselves to the unseen guardians of this land. Only then – rather like leaving your calling card with the doorman at the entrance of a grand estate – were we welcomed in to the mysteries of the ancient Mayan practices. The most important part of our journey was in planetary service, assisting in the dissemination of universal wisdom through the spiritual highways linking this area to the rest of the world, but for each one of us who offered and committed ourselves in this way, we were gifted too, with deep realizations and with personal transformation. Before I started to travel a lot, I used to wonder why spirit beings in other dimensions weren’t able to just get on with the planetary work themselves. Why couldn’t infinite wisdom sort out every earthly glitch or instigate needed evolution without the involvement of any of us human beings? Of course it can for some things, but as it turns out, the human body is an incredibly valuable thing, especially if you don’t have one! It is needed to assist not only in our own transformation, largely through teaching us how to evolve through relationship, but also embodied life is needed to make consciousness real. To do so consciousness needs, firstly, to be anchored into our time/space continuum, and for that to happen it has to transduce down through our spiritual structures into the denser cellular structures of existence. As these energies slow down and are absorbed through our bodies, they can ground in a way that forms and affects us here on earth. So, the natural world, but most particularly the human being (because of our mobility and capacity for intelligent action) is an important component in disseminating and anchoring this change. Even as we aligned in Planetary service, personal transformation was always present. Each time I have heeded my inner call to travel, I have reunited with ancient aspects of my being at the places I’ve visited, and, as each pilgrimage of the heart has presented itself, barriers that have restricted my ability to live from the heart have fallen away. It’s nice to know about ones highest aspects, and at times I’ve only allowed myself to acknowledge my gifts, but before going to Mexico I also knew I was being called to meet my unprocessed shadow, the parts of myself that I have found unpalatable, and to accept, understand, and forgive myself for my actions in past and present times. I’d been experiencing and consciously working through layers of shame and self-hatred through most of the previous year, meeting feelings and shadow issues that it had taken me a life time to face, and in the weeks leading up to the trip this awareness intensified. The call to go was inescapable, but that didn’t stop me feeling some fear and trepidation about what I might encounter. 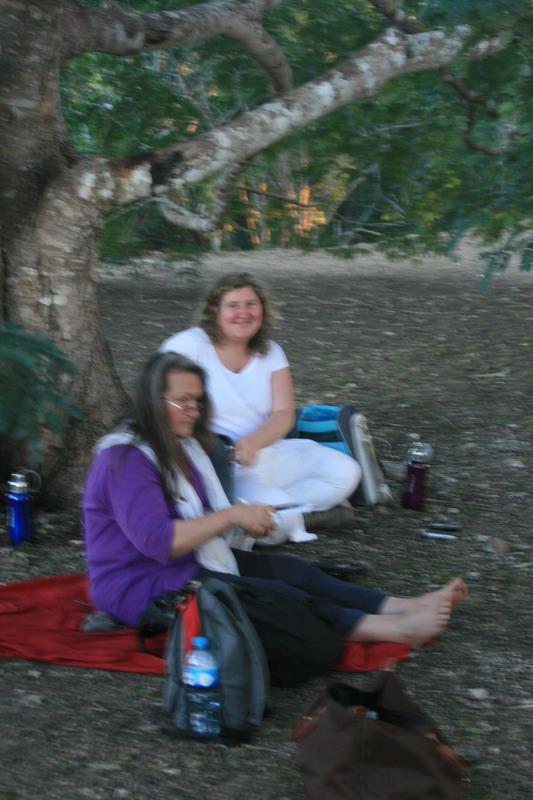 Our group met up near Uxmal, and then we settled in to two days of intense practices and introductions to the ways through which we were to work at the sacred sites in front of the great pyramid there. In those days we began the profound earthwork that we’d been drawn to participate in. One unexpected challenge each day was to sit in a meditation circle in a public site and not be distracted by the commotion around us. 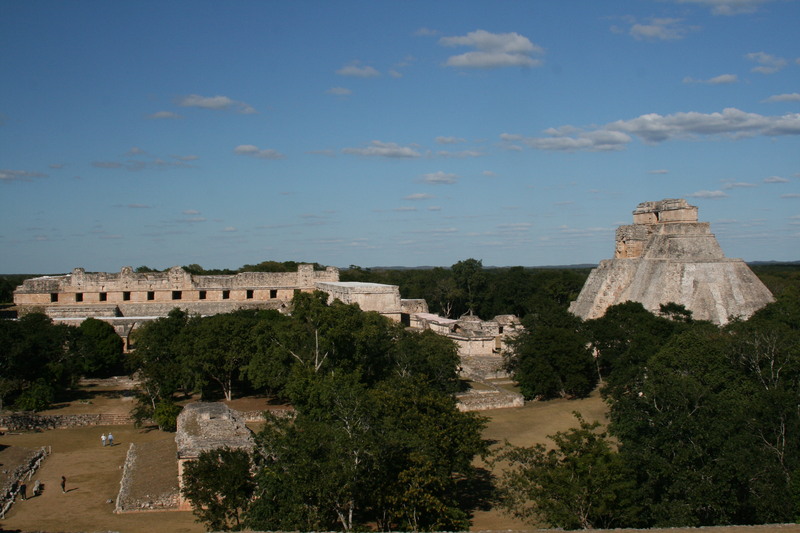 At Chichen Itza, our next stop, which is now officially designated a World Heritage site, the sound was often deafening. 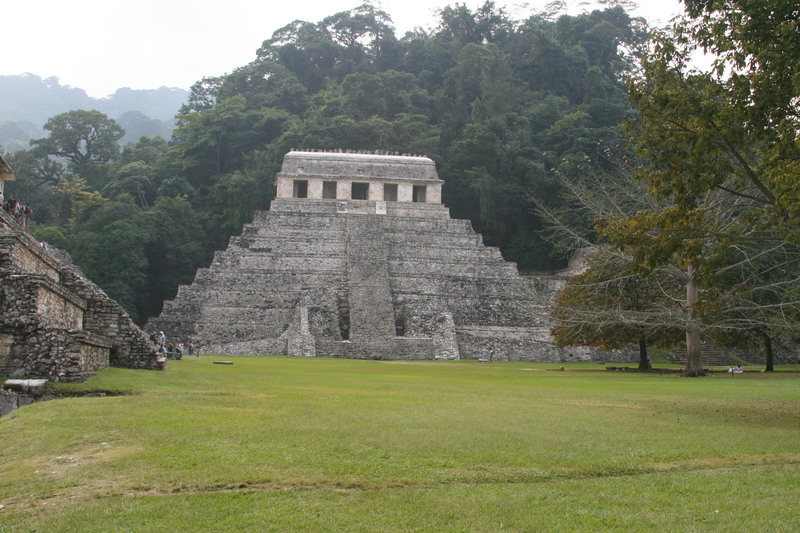 Vendors line the outer paths, continuously blowing on Jaguar whistles, whilst tour guides, standing in front of the pyramid, clap to demonstrate how the pyramid amplifies and echoes incoming sound. It is surreal to be aware of this on one level and on another to be deeply traversing other planes of existence. Where we could we rose before dawn to sit, undisturbed in the quiet before the site officially opened, so as to travel through the energetic gates at the pyramid free from interference. My experiences, from the very first moment, opened my heart. I was gifted in my ancient reunion with guides and companions, and tools to help me as I journeyed out again – a cloak, sandals, a sword, a Tzolkin Wheel, and a new vibrational body. My thoughts at the end of each day began to sound like a broken record to me. On a daily basis I was bowled over by at least one of the three or four practices we sat for, sure that That experience was why I had come – for That meditation of service and remembrance, only to have another equally profound journey the next day. On one cool morning at Chichen Itza as I traveled spiritually through the far away galactic doorways opened to me, I felt what I perceived as bindings finally fall away, first from my root, and then from my heart, until each chakra fully opened like a lotus flower, so that I recognized without any doubt that in that moment I was finally free. It was incredibly joyful, and at the same time as the realization flooded my being, the relief I experienced was enormous and overwhelming. I initially feared that this state would contract, but it doesn’t and hasn’t, and I now trust that it won’t. As humankind comes up to the ending cycles of the Mayan Calendar, we are ripe to open to new ways of operating, and the possibilities for greater wisdom and consciousness to be seeded in us and through us all is great. Some of us are already ready, but where not quite, humanity is being invited by the cosmos to shift and change so that all will be able to embrace different ways of acting and perceiving. These are not the-end-of-the-world times, which are often presented in catastrophic terms by our media, they are the-embodying-of-enlightened-action times. We are being invited to open our hearts in compassion, and act through wisdom to resolve the difficulties we all face, and adopt a more unified way of thinking and being. Out with extreme separation and defensive, fear-filled action; In with harmony, balance, and appreciation of our unique ways, our differences, and the beauty of our habitat. The Mayans have spelled this out in their calendar. Many of us are frightened of the unknown, but in fact, in this instance we don’t need to be – we have a roadmap to a new beginning. They’ve gifted us with that. 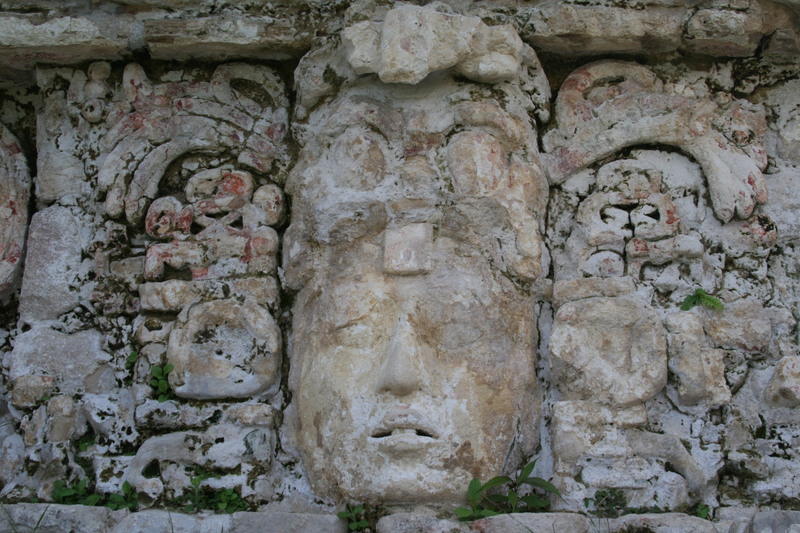 As I write, I am still integrating the many different facets of this journey, taking in the profound nature of my experiences in just a few of the sacred sites of the Maya in Mexico. I am filled with gratitude for the gifts I was given, for the friends I traveled with, and most particularly for the incredible being who guided me in the remembering – Qala. Everyone needs allies as they travel, I am blessed by all of mine. For information about Qala and her work visit her website, www.qalasriama.com. From inception there has been a natural state of harmony and respect in the relationship between Man, Land and the Divine Nature of all Being. Over the centuries this has weakened and, as more people converge around towns and cities, it has often been completely lost. Remembering our intimate relationship with the planet we live on is vital to our well-being, and not just because we live and walk on her, but because her base components, the metals, minerals and ores that are part of her bedrock and make up her plant kingdoms are also part of our bedrock and the elements that interweave through our biology. Taking an active stance in offering myself in service to the earth has given me a much deeper understanding of how far we have drifted away from a balanced, harmonious relationship with all levels of life from individual existence to the planetary whole. The irony is that how we treat the earth is reflected in each one of us. It affects our health, our attitudes, our feelings of safety or survival, and also the amount of separation we feel within ourselves and from each other. Whether we are aware of it or not, by treating the earth, her lands, and her other residents responsibly and respectfully, we automatically and seamlessly create harmony and balance for ourselves. There are plenty of teachings out there that address the importance of generating harmony. They direct us to recognize that the attitudes we hold and the actions we take create our realities. Restoring balance between our personalities, our spiritual or infinite natures, and Life is a profound practice, and one that brings amazing results. If we can change the balance of how we hold our beliefs and then walk them in life, we can change the way we live and positively affect the planet and how we interact with her. It is possible to do this simply by bringing awareness to our thoughts and deeds. Earthwork starts right here. The first step is in bringing awareness and understanding to our own psyches. This can mean moving away from positions of selfishness; noticing where we see things in material terms and value them according to how we can utilize them to serve our needs, and where we appreciate them for their intrinsic beauty or design. Harmony needs to be recognized and cultivated within in order for us to live it easily from a state of appreciation for the world. Once embodied at a personal level, it naturally cascades out globally. To undertake energetic earthwork can be a sticky tricky path in today’s New Agie communities. There are many of us out there who want to help restore the balance between earth, and her most destructive resident, man. There is a danger in ‘doing’ this without taking the earth herself into account. Our place is not to impose, but to offer up our physical selves so that planetary structures, alignments and energies that have been affected by our interactions can be nourished back to their natural state, one of harmony between all elements. Ours, then, is only to be the bums on the seats – channels through which the energetics of change can flow – giving up any agenda, and letting Gaia herself open up her own natural rhythms, energies and connections to correct and repair the pollution, degradation, and destruction caused by our actions. To be the conduit for change, in alignment with the earth’s highest good is, I believe, one of the greatest services we can offer, and to do this in a way that is honoring and free of the need for any positive outcome is vital. I am very grateful in these times to be part of a community, under the guidance of Dr. Patricia Fields, that is focused on the ingredients needed to take on the role of earth worker, or earth supporter. My own feeling is that this ‘job’, by its nature is something that does not require, nor asks for, any acknowledgement. It will unfold in a way that is exactly right for the region, aspect, or structure that is being treated without our beliefs or willful intentions getting in the way. There are, however, a few basic ingredients to consider, including asking for spiritual help. Earthwork may involve multiple aspects and elements that need to be addressed in order for the land or region to come back into harmonious alignment. In general, because of this need to operate on many levels at once, the most impactful earthwork happens in community. There are quite a few reasons for this, not least of which is the increased wattage available in a group field, as well as the energetic diversity that is then present, thus allowing different issues to be resolved simultaneously. I had some questions before committing myself to group work. These included satisfying my own sensitivity to ‘tinkering’ with the earth in any way that felt disrespectful. 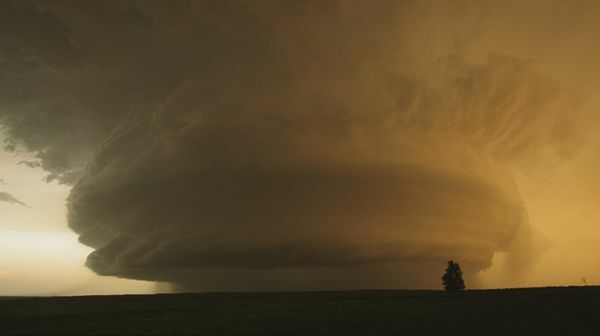 How was I to know if the earth wanted me to ‘interfere’? How was I to know if the way I aligned myself to the task at hand was right? Well, the answer came through loud and clear. Use guidance, and ask for help. Receiving permission from the land, her spiritual guides, and her guardians is crucial to ensuring right relationship with Gaia, but if permission isn’t given, being prepared to accept ‘no’ and let go is essential. It is also crucial to double check if there is any personal agenda behind the intention. This is the domain of the ego and that is not welcome in this work because of its potential to color the process and affect the outcome. Finally, the work ultimately comes from the heart not from the mind. As in individual process work, even the slightest shift on a personal level can impact a whole network of relationships. So it is with earthwork. A small area assisted in coming back into balance can allow a massive realignment to the planetary whole. I encourage all to undertake this work, starting with the self and moving out from there, to positively affect our collective experience and restore a respectful interaction between Man, Land and the infinite Spirit that moves through us all. Start your own group. Work together in person, or long distance by telephone. But Start! ‘Be Still and Know that I am God’ ~ Psalms 46:10. We live in an age in which the vast majority of us wear a uniform of sorts, maybe literally in what we choose or have to wear, but also in the ‘masks’ or personas we adopt that project an identity out to those around us, sometimes without even a single word being uttered. Riding regularly on the subway from the north of Manhattan down to Soho, I have plenty of time to be curious about my fellow commuters, and I often look to see who is there in the Stillness behind some of the masks being worn that day. Last month I attended a lecture in a huge Manhattan church given by author and teacher, Eckhart Tolle. He starting off the evening with a scenario that he imagined any one of us gathered there might have been experiencing in some form. He adopted our inner voice’s dialogue, berating the fact that we were sitting on hard pews, noting that our internal registering of the hardness of the pews and the soreness of our bums would give way to negative chatter, complaining about our neighbors – the depth of their breathing, their terrible choice of clothes, their annoying coughs, and so on … our egos doing anything rather than sit silently and drop into the stillness of the heart, the gateway through which awake Awareness emerges and the ego’s influence ceases. It was a great analogy. He reminded me that the voice of the ego with its limiting assessments, judging, and complaining was what was keeping me separate from my natural state of being. Tolle reminded us that it is only when you are completely still that the truth of existence, the truth of our natural state clarifies beyond doubt. A few days later the consequences of maintaining an attitude of separation was brought home to me after I’d traveled by train to Connecticut. While I was trying to decide which direction to take from the station, a friendly lady came up to me who’d also just got off the train. She asked me where I was going and if I would like to share a cab. We climbed in together and started chatting. We had a lot of common interests, and I quickly learned which teachers my companion valued, how long she had been studying this or that, and all in language that let me know that she was an experienced ‘seeker’, serious about following a path of awakening. She had about her an air of superiority which I found off-putting, but it was only when I dropped into Stillness that I could see that, in fact, she felt vulnerable and was using her superiority mask to cover it. It left me reflecting on the fact that, in these fast paced days, more often than not we make quick assessments of the people we are with, based both on our own conditioned awareness, and on the mask they present us with. How easy it is to pigeon-hole someone by, say, the type of jewelry they wear; the handbags or briefcases they carry; the low slung jeans; or the facelift, and styled hair. I realized how easy it is to forget to look beyond that and see who is really there peering out from behind their mask. In forgetting this, there have been countless times when I have missed connecting. In psychological terms, even when relaxed most of us wear masks that we set into place to cover up old hurts. They help us survive and flourish in this world. Part of the challenge for someone pursuing a path of remembering is to gradually soften and then drop out of the habitual masks of our defenses and lifestyles so that the true essence of our unfettered nature, love, can shine out. It can feel as if you are standing buck naked, vulnerable and exposed before a crowd. Who are you without your familiar identity? I initially felt absolutely lost without mine (see Blog posting ‘The Life and Death of the Identity’, Nov. 2009). Our masks may be familiar, but it is entirely possible to be completely unaware of them. One of the ‘faces’ that I show the world has this type of voice that goes with it … ‘Everything is fine ..I really LOVE it’. It is a very well used serenity mask that is often enlivened by a smile, and it allows the uncertainty and the fear underneath to go undetected. It is so deeply engrained that sometimes I don’t know I am hiding behind it. It has taken a lot of work, and no small measure of courage, to be prepared to recognize when and why I put on that mask and others, and the attitude that accompanies each one, and then to make the choice to drop into vulnerability and allow the real Sarah to be seen. As I have become steadier in my evolution and in my understanding that I no longer need to hold onto the old defenses that I set in place out of uncertainty or fear, I spend more time without my masks, feeling from my heart rather than acting from my mind. It is a journey of learning to connect with my authentic self in each moment, and to deepen into a place of inner silence. At a recent meditation retreat with my VortexHealing® group, we were encouraged to consciously drop into silence and embody our awakened consciousness both when sitting in internalized meditation, and also with the eyes open, taking in everything around us – Living it. In that place where Stillness is complete, absolutely motionless, without even a sense of a heartbeat, the truth of existence shines out, and the small, critical, worried voice of the ego can relax and allow Presence to become the prevailing state of being. A level of tension drops away as the sacred energies expressed through the heart take over from the relentless chattering of the mind. It sounds easy, but silencing the mind can be really challenging. The ego always has some diversion up its sleeve. Moving deeply into the heart and staying there, giving stillness time to emerge may initially need to be a conscious choice, at least until the ‘muscle’ is built so that living from that place is the immediate, natural state of being. One of the benefits of living from this awakened space is that I am looking out and feeling that place of stillness in others, more regularly seeing them for who they truly are rather than from the masks that they have put out for the world to see. The conditioned reality I live from still colors that experience, but, riding the subway, I am now making a daily practice of living from the stillness in myself and honoring and seeing the stillness at the core of those nearby. It’s a great and sometimes challenging practice. It is one that naturally opens the heart and generates compassion. I like this simple meditation practice…I hope you do too. It helps me to find my way into stillness and deepen into the silence residing within. Sitting comfortably, bring your attention to your Heart center, in the center of your chest. Follow your awareness back into the middle of your being until you are resting at – what might feel like – a gateway into the infinite nature of Creation. Relax there, allowing your attention to drop deeper and deeper through the Heart and into that space. As you notice your mind wandering, bringing your attention back to the center of your Heart until it is lulled into silence and you can step through the gateway, and rest your consciousness in the Stillness of awake Awareness, into All that Is. Whether you are aware of it or not, the Death Force, a powerful evolutionary force that assists us in making way for new Life to come into being, has been propelling us forward and clearing the decks so that we can make new choices about how we live our lives. The Death Force is not really about physical death in the sense of personal loss. In fact, it doesn’t have to have a personal component at all, because its main focus is on the completion of life cycles, regardless of whether these are individually or collectively held. This year it seems to have upped the ante. Most of us recognize and appreciate the characteristics of the Life Force, but although the Death Force is acknowledged for its fearsome powers, it is rare for it to be viewed as a positive, powerful current. Both forces allow us to create and to grow in a way that is in true alignment with the earth, taking into account the spiritual and physical health of the planet as well as our relationship to it. Like the electric and magnetic forces which are also always in relationship with one another, they run through each one of us from the time of our birth forwards. As we are born, the Life Force nourishes the physical body and helps us to survive, thrive, and find our place on this planet. 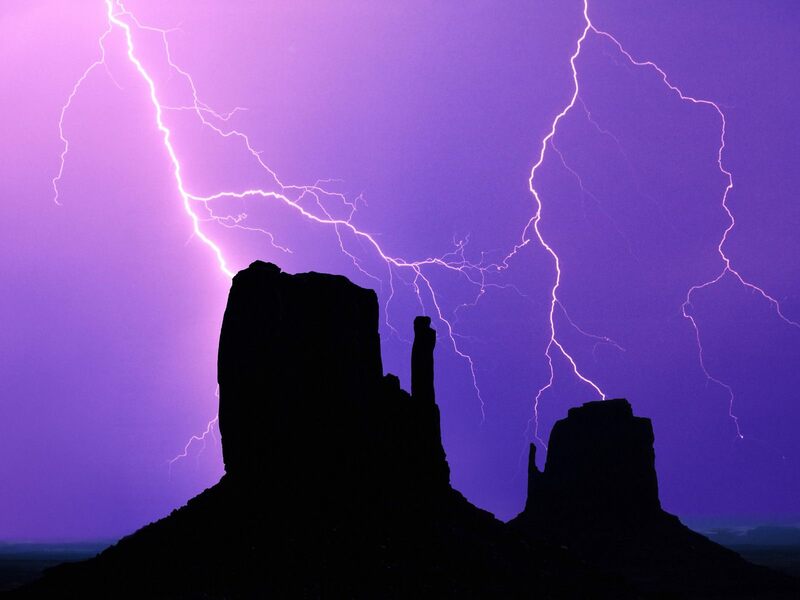 It is one of the most powerful sources of natural energy here, and the closest thing to Spirit that we have. In its purity the Life Force is self-generative and nurturing, giving a feeling of connection to everything, not just on earth, but universally. When in distortion it can be willful, fearful, and destructive, and directed either inwards, or outward towards others. Our issues around survival may be triggered, and we may go into separation, setting up defenses between ourselves and any perceived threat to our existence and, when that happens, judgments start to color our decisions. As a collective this distortion leads to the persecution of others, wars, egoic actions and intolerance. And those same types of distortions appear in the Death Force if it is engaged impurely. In a balanced existence the Death Force gives us freedom to move on, evolve, and transform as we grow. I’ve encountered the Death Force in various forms and ways as I have been drawn on pilgrimages to sacred lands around the world. One of these places, Mount Kailash, is the earthly home of the Hindu God, Lord Shiva. He holds destruction and transformation in his hands, and, because of this he is also the one who creates the space for life to be reborn. 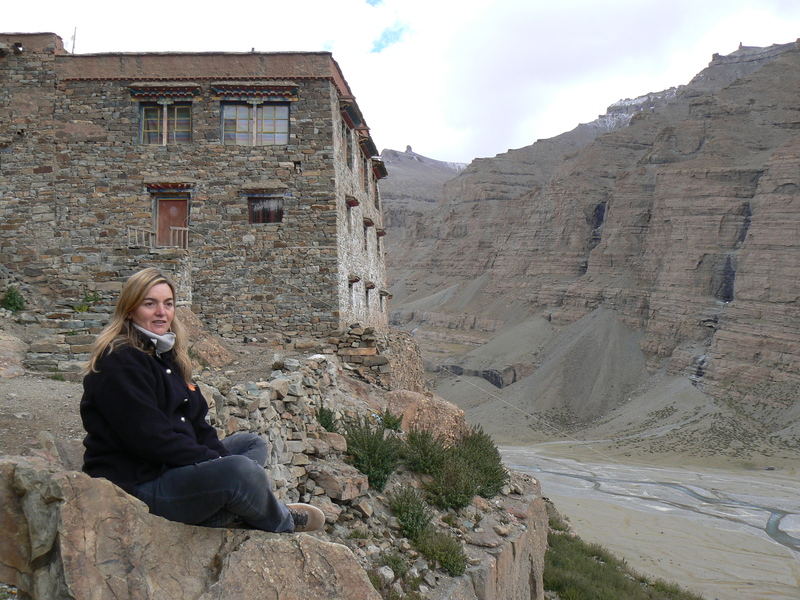 While there I experienced both the letting go – the death – of aspects of my being that were no longer serving me, and then the movement into a new relationship to Life (see, Pilgrimage of the Heart: Mount Kailash, Tibet, January 2010). This movement was completely impersonal, holding no account for my physical being, or what my egoic self might believe to be important, just operating like the cleanest and most skilled of surgeons, cutting away the old to allow new life to be seeded and to germinate. And, most unexpectedly I found, and continue to find when actively engaged with the Death Force, that though impersonal, its effects are heart-centered. We are living in accelerated times, and so it isn’t surprising that the Death Force is displaying our illusions, distortions, and greed to us written large in neon signs. Our individual dramas, which often include elements of misconception, self-interest, and cruelty are being highlighted and reflected in the collective consciousness that we feed into, some of which is quite dark. We are constantly being given the opportunity to see that what we are creating in our own lives is no more or less than a microcosm of what we are creating in our greater communities. Going through a process of self-enquiry, and in apportioning responsibility, I’ve noticed that I can’t absolve myself of culpability and place all the ills at the doorstep of the greedy conglomerate, or the corrupt government, because it is clear to me that I am complicit in my passive response to planetary issues created or exacerbated by their actions. I am seeing in some of those places where I am judging others that, in fact, I haven’t let go and addressed those same issues in myself. For instance, I rail against the oil companies and their self-interested behavior, but I am still flying around the world leaving my carbon footprint behind me. Even though I know I am contributing to world pollution, like those companies my agenda overrides my concern for the wellbeing of the planet. And, I know that the true cost of drawing the fuel needed to get my plane off the ground, is not just in the pollution levels in the air, but to the forests, lands, rivers and oceans that are now destroyed or contaminated because of it. It is easy to be critical of others. Conversely, it is a powerful, humbling practice to realize that the buck doesn’t stop there – it really stops here! At a collective level the Death Force can be slow to work, because great change only comes when a tipping point of consciousness has been met, and there are still so many places where we ignore the fact that we are all deep down ONE TRIBE. We could take a stand and welcome in the Death Force – Any one of our current issues might draw its attention; or it might come forward from a desire for a new perspective or social structure; the realization that certain actions are intolerable, that certain attitudes need to change, that old relationships no longer work, and that it is time to move on. It’s tiring putting so much energy into maintaining a position of separation. Instead we could acknowledgment that the ‘ponzi scheme’ that we bought into cannot sustain us and has to go however deep the personal sacrifice could be. Maybe that change will affect how we live our lives, but the Maydorf-mentality (of sinking deeper into the mire because we can’t see a way out) will never become right, and like Maydorf himself, we can only resist the inevitable for so long. After that the game is up, the rule of law is applied – in this case universal law – and the consequences have to be faced. It takes courage to initiate action, to let go of that final grasping hold on a familiar way of being, and it takes courage to dive into the current of the Death Force in total surrender. Letting go, no matter how alarming that might be, allows everything that is out of integrity or out of alignment to be swept away in its raging currents, and then it allows us to re-emerge carrying the seeds and/or gifts of new Life, the Life Force. It’s the archetypal journey of the hero or heroine, like those of the Baggins’ in J.R.R. Tolkien’s books, The Hobbit, and The Lord of the Rings. We may have to stand in our truth, trusting and shaking in our boots, as the old is stripped away and new ways are born – ways that can be embraced and walked into life, that are rich in such true qualities as wisdom, kindness, compassion, and generosity. These are powerful times. For some of us it is becoming increasingly hard to live in realities colored by our histories, or, on a larger scale, under the mantle of dogma and control that our governments would like us to submit to, presented in a variety of guises. The truth is that we needn’t buy into this 3rd dimensional reality where self-interest and fear rule. The Death Force is waiting for us to wake up to the signs around us – the increasingly unpredictable and violent movements of nature; the unsustainability of our life styles; the instability of our financial structures; the breakdown in our social/family lives; the loss of balance with the land we live on. We are being invited to let go now. We can slough off the old 3rd dimensional skin that we have been wearing uneasily for so long, and move to a new reality – one of greater consciousness, with never-before-thought-of technology that supports our growth, and growth that supports our planet. The potential of all these things is out there already. In November we move into the final phase of the Mayan Calendar, a period of roughly a year in length that takes us to the dawning of 2012. In these last few weeks, before we move out of the 6th Night energies that are currently enveloping us, we are being encouraged to go over what no longer works in our lives, to resolve those places where we have maintained separation, to end destructive behaviors, and to make way for an enlightened understanding of existence to emerge. These times NOW are ruled by the Death Force – and we have the wattage and the impetus behind us to end old ways. Seize the Day!! The opportunity, the invitation to change is being presented to us in louder and louder tones so that we can fully understand the consequences of inaction, should we choose to continue to ignore the call. The challenge is to let go and move into the unknown, and then let Life do the rest. And here’s the rub – in the end there is no choice. We will let go. These cycles on both the microcosmic and macrocosmic levels will end in a way, and at a pace that is divinely ordered by Grace, not by us. We cannot dictate when the Death Force will sit at our table. The only thing that is ours to choose is the way and the spirit in which we embrace it, and so the manner in which we step fully into Life.